Calling all returning students: If you had a great experience at NBTB 2o15 and you’d like to help other students like you to do the same, consider joining our NBTB 2016 team as a counselor-in-training. 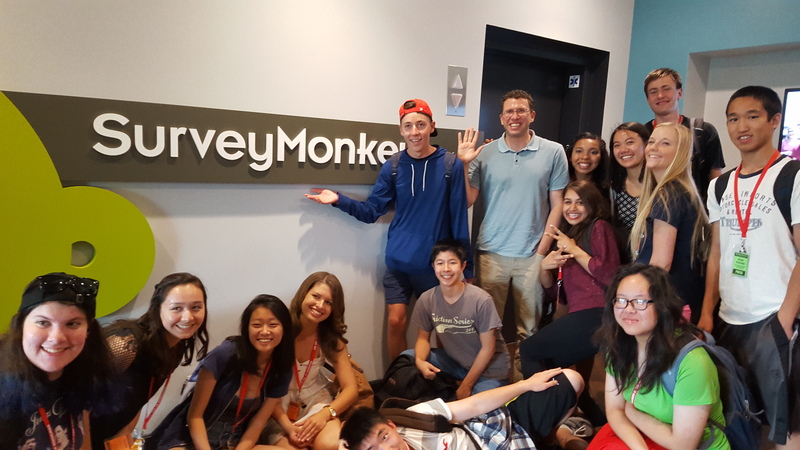 CIT Xavi Boluna (center, in grey T-shirt) takes part in a field trip to SurveyMonkey in Palo Alto during NBTB 2015. The application is live now and the deadline is Feb. 15. We’ll be asking for your insights, thoughts and ideas about how to build a better program, along with the specific skills and talents you can bring to our team. Residential CITs pay a discounted rate of $1,095 and enroll as Year 2 students, including housing, dining, field trip tickets, transportation and all program costs. Commuter CITs also enroll as Y2 students, participate in all activities and receive meal tickets for lunch at no charge. This opportunity is for returning students only and is specifically for students we consider to be exceptional in their commitment and practice of student journalism. Typically we hire two counselors per year. You should be available for training on Saturday, June 25 prior to camp and be available to help us with check-out on Sunday, July 3. For more information, please contact us at newsroombythebay@gmail.com.